Tánaiste Simon Coveney has been challenged to “fess up” and admit the Rebuilding Ireland plan he launched as housing minister is just not working as the number homeless people topped 10,000. Fianna Fáil deputy leader Dara Calleary told the Dáil there is “sadness and anger” at the latest statistics. They show 10,264 people in emergency accommodation including 3,784 children. The Government was also heavily criticised by Sinn Féin and People Before Profit TD, Richard Boyd Barrett, who said the Government should be “ashamed of themselves”. But the Government Tánaiste, Simon Coveney, hit back and argued that progress was being made in difficult problem where more people were coming into the housing market. “I think it’s important to deal with the facts as well as the emotion,” the Tánaiste said. Mr Calleary said the figures have been “massaged” and told Mr Coveney that “despite the spin” the homeless numbers have increased “under your watch”. In July 2016 there were 6,500 homeless but this was now above 10,000. He said that as housing minister Mr Coveney had launched the Rebuilding Ireland plan which was said at the time to be “ambitious”. 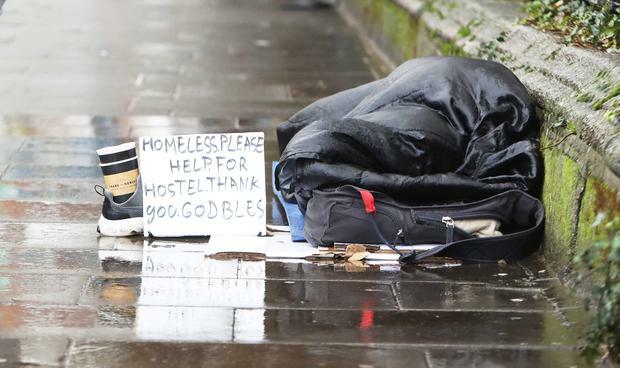 Sinn Féin deputy leader Pearse Doherty also criticised the Government homeless record. “There are 4,000 children whose lives are wrecked before they’ve even begun,” Mr Doherty said. The Sinn Féin TD also criticised Fianna Fáil for keeping the Government in power and especially for failing to back his party’s plan for strict rent controls and curbs on landlords evicting tenants. For the Government Mr Coveney said there would be 50,000 extra social homes provided by 2021 and more families were getting homes. There were more family hubs being provided – though these were a temporary solution and families needed home. “We are trying to fix a fundamentally broken market that collapsed during a property and banking crisis,” the Tánaiste said. He said moves to provide more housing supply would continue along with efforts to keep tenants in difficulty in their rented homes.